SLAVYANSK, Ukraine -- Sustained gunfire was heard throughout the night near the eastern Ukrainian city of Slavyansk, the stronghold of pro-Russia fighters, ahead of a second round of European-brokered talks on Saturday aimed at resolving the crisis. The Russian Foreign Ministry issued a statement condemning what it described as a sharp escalation in the violence in eastern Ukraine, accusing the Ukrainian government of using the talks as cover for military operations against its citizens. As politicians from the east sat down with government officials for another round of talks, their grievances focused on the government's refusal to acknowledge that many people in the east, desperate to be heard, willingly came out to vote in last weekend's referendum on independence. On the outskirts of Slavyansk, the fighting began late Friday when forces loyal to the Kiev government moved in to protect a television tower near the small village of Andriyivka. Residents said it went on through the night. Debris from the shooting was visible Saturday morning, including a badly damaged train and craters caused by mortar bombs or other heavy artillery. The Russian Foreign Ministry said some people were wounded, but gave no specifics. Government forces in recent weeks have achieved only limited results in quashing the self-styled Donetsk and Luhansk "people's republics," which declared independence for their regions following the contentious referendums. Polls have shown, however, that a majority of eastern Ukrainians support a united country, although most are too fearful of the armed separatists to say so publicly. In one southeastern city, Mariupol, steelworkers retook government buildings from pro-Russia fighters and cleared away their barricades. Mariupol is a major industrial city in the Donetsk region, lying on the main road between Russia and the Crimean Peninsula, which Russia annexed in March. And in the eastern village of Velyka Novosilka, armed backers of Ukrainian unity dressed in black seized control of a police station and vowed to expel the separatists in Donetsk through force if necessary. Other similar and apparently unaccountable groups look to be emerging elsewhere in the chaotic east. 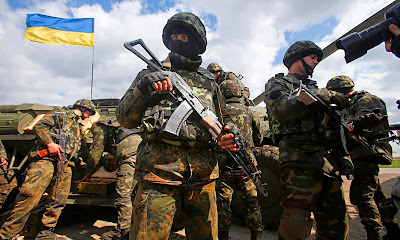 Should they make substantial incursions, it is unclear whether they will be perceived as liberators or attackers working for the little-liked central government in Kiev. The latter could precipitate civil conflict. The first round of talks on Ukraine's future was held Wednesday in Kiev, but brought few visible results since those who declared independence in the east were not invited. The second round began Saturday in Kharkiv, an eastern city that has not seen major insurgent activity. As on Wednesday, the talks included officials, lawmakers, business people and religious leaders from across the country, but no representatives of the separatists from Donetsk and Luhansk. Politicians from the east implored the government to believe that apart from the pro-Russia gunmen, there is a genuinely large portion of population who are desperate and want the government to heed their demands. "The referendum doesn't have any legal consequences," said Valery Holenko, chairman of the Luhansk regional government. "But it has expressed the will of the people, which cannot be discounted. People genuinely went en masse to the referendum. This was a protest vote." Holenko said the devolution of powers that the government is offering is no longer enough and that as a first step in appeasing eastern Ukrainians the government has to stop the "anti-terrorist operation" in the east. Government officials did not reply to these and similar comments. Acting Prime Minister Arseniy Yatsenyuk was often busy with his iPad while some of the eastern lawmakers were making passionate speeches. Oleksandr Bandurka, a Communist party lawmaker and police general from central Ukraine, said that the round-table talks make no sense because "we're not talking to those who oppose us. We cannot ignore them." Ukraine's first president, Leonid Kravchuk, who is chairing the talks, angrily reacted that "no one in the world talks to killers and terrorists. Putin doesn't talk to terrorists." Russia has pushed for Ukraine to give more power to its regions, since that would allow Moscow to retain influence over areas in Ukraine dominated by Russian-speakers. Many in western Ukraine, including in the capital, favor closer ties to Europe and fear being pulled back into Moscow's orbit.